Washington Nationals ace Stephen Strasburg will start Game 4 of the NL Division Series against the Chicago Cubs after all. 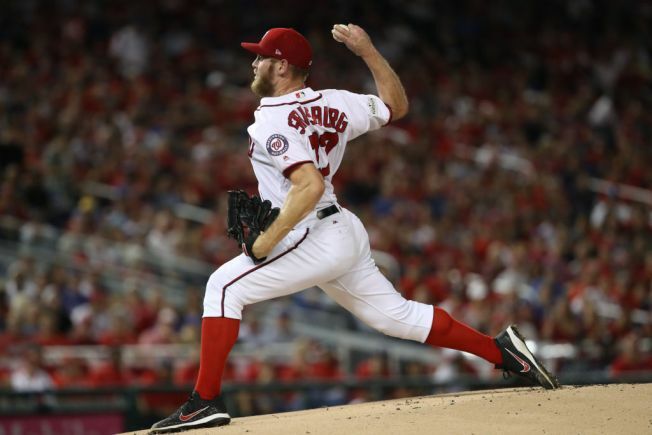 The Nationals announced several hours before Wednesday's scheduled first pitch they were going with Strasburg, hoping he can send the series back to Washington for a Game 5 on Thursday. Manager Dusty Baker made a surprising announcement after Tuesday's rainout that he was sticking with Tanner Roark instead of going with Strasburg on regular rest. Strasburg, the No. 1 overall pick in the 2009 draft, went 15-4 with a 2.52 ERA during the regular season and turned in a dominant performance in a 3-0 loss to the Cubs in the series opener. General manager Mike Rizzo said Wednesday Strasburg developed a fever, chills and acute sinusitis in the days following Game 1. He has been taking antibiotics and anti-inflammatories as well as IV fluids. Rizzo said Strasburg had no endurance during Monday's bullpen session. When the game got rained out on Tuesday, the right-hander told the Nationals he would be willing to start Wednesday but wasn't sure how effective he could be. They decided to go with Roark instead but changed course because Strasburg was feeling better. "This morning he felt much more like Stephen Strasburg," Rizzo said. "He came into the clubhouse and went right to the manager's office and said, 'I want to start this game.' The fact that he was much more like the real Stephen Strasburg, we felt like that Stephen Strasburg gave us a much better chance to win the game." The Cubs stayed with right-hander Jake Arrieta for Game 4, but manager Joe Maddon altered his lineup after the Nationals switched from Roark to Strasburg. Jason Heyward got the start in right field, Ben Zobrist moved from right to left and Kyle Schwarber was bumped to the bench. Chicago won 2-1 at home Monday. The winner of the NLDS takes on the Dodgers in the next round, scheduled to begin Saturday in Los Angeles. Roark is from Wilmington, Illinois, about 60 miles south of Chicago, and grew up rooting for the Cubs. Baker praised Roark's "warrior mentality" on Monday, but Strasburg has been on a roll for the past couple months. With Max Scherzer nursing his own right hamstring injury, Strasburg got the ball in Game 1 Friday. He was working on a no-hitter before Kris Bryant and Anthony Rizzo hit consecutive RBI singles with two outs in the sixth inning. Strasburg struck out 10 in seven innings and was charged with two unearned runs and three hits, but the Nationals were shut down by Kyle Hendricks and two relievers. Going back to the regular season, the San Diego native is 5-2 with a 0.74 ERA and 73 Ks in 60 2/3 innings over his last nine starts. Baker had said Strasburg would start Game 5 if the series went far. Now Gio Gonzalez likely will get the ball if the Nationals win Wednesday, with Scherzer possibly available out of the bullpen.